You know how BookedIN helps businesses: Get Noticed. Get Booked. Get Paid. Well, we just got even better at the last part. BookedIN already allows you to collect up-front payments and deposits from clients when they booked online and send payment reminders after an appointment. Now we’ve given you the ability to sell products, additional services and collect payment for bookings made offline! It only takes two clicks to get paid. When you send a payment request, the recipient will immediately receive an email with a “Pay Now” button. They can pay via credit card or PayPal and the money gets immediately forwarded to your PayPal account (minus processing fees). And don’t worry, we’ll take care of the receipt as well. You can request payments from anyone, not just existing clients. A history of each payment is stored in your client database. You can cancel previous requests and easily refund a payment, if you need to. 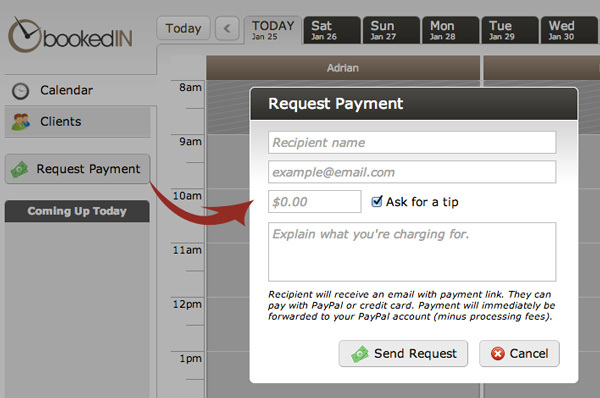 This was the first payment feature introduced to BookedIN and it’s still the most popular. It allows your business to collect payments or deposits from your clients when they book online through your Business Webpage. It’s a great way to get commitment from your clients and cut down on no-shows. Everybody knows the early bird gets the worm but with BookedIN they can also get a discount. With Pay Via Email, you can automatically send reminders to your clients to pay for their service after booking an appointment. You can even offer a discount to encourage your clients to pay early! No matter how you decide to collect payments via BookedIN your clients can pay via credit card or PayPal and money is immediately transferred into your PayPal account. Refunds are simple and you’ll always have a complete payment history in your BookedIN client database. If you’re not using these features yet you can see all the setup details by visiting our FAQ. If you’re not using BookedIN you can sign up by here and you’ll be getting noticed, getting booked and getting paid in no time! See our current press release on payment features here.